HEAPRO maintenance and window cleaning kit is packed with all the safety equipment's you might need and can imagine.The kit comes with top quality multipurpose harness, anchorage rope, kernmantle rope, karabiner, descended, tool bag,fall arrester, webbing sling, and HEAPRO’s special swing set and kit bag. HEAPRO maintenance and window cleaning kit is packed with all the safety equipment's you might need and can imagine. 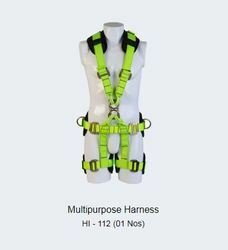 The kit comes with top quality multipurpose harness, anchorage rope, kernmantle rope, karabiner, descended, tool bag, fall arrester, webbing sling, and HEAPRO’s special swing set and kit bag. 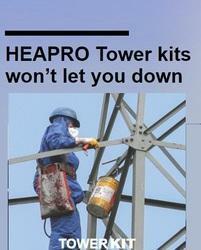 Keep rising high, HEAPRO Tower kit is there to protect you. We know how challenging your job is, and our aim is to make is a little easier for you. HEAPRO's tower kit is here to take care of your safety with multipurpose harness, fall arrester, tool bag, anchorage rope, work positioning, forked lanyard and HEAPRO's premium kit bag. Kit Include Fall Arrester, Polyamide Rope, Tool Bag, Knife, Cows Tail, Forked Lanyard etc. Accidents can happen anytime and anywhere, hence it is best to be prepared beforehand. HEAPRO rescue kit comes with all the equipment's you might need to save a fellow worker, or a friend, if a mishap is to occur. 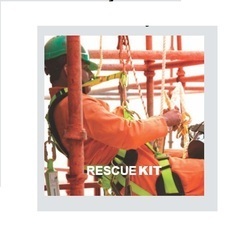 HEAPRO rescue kit contains multipurpose harness, fall arrester, webbing sling, work positioning, cows tail, karabiner, anchorage rope, descender, forked lanyard, kernmantle rope and HEAPRO’s premium kit bag.